"Unit One has been awakened and set free. SELEE won't stay quiet for this." Starting off these Evangelion reviews is getting to be a bit tricky. How many different ways are there of saying "this volume is the best yet" or "the episodes keep getting more and more complex and unique"? Disc six includes episodes 18-20 from the 26 episode series, and answers provided in this volume only lead to new questions. The plot is so dense and thrilling that three episodes per disc hardly seems enough. Luckily, there are only six more episodes in the series, so it shouldn't be too hard to tough it out. In a change from the last few dramatic, talky episodes, episode 18 is all-out action. Evangelion Unit Three is flown in from America, and everyone knows who will pilot it except Shinji. 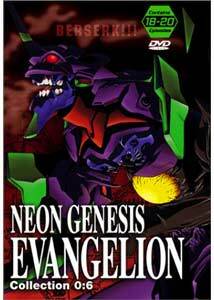 When the next Angel infects the new Eva, however, Shinji is forced once more into battle, this time with harrowing results. This episode is a prime example of why this series is regarded as one of the best anime of all time. It blends great action and animation with touching character moments and stirring drama. Make sure to listen to the original Japanese, by the way. The performances (especially from Shinji) are great, whereas the American dub sounds a bit grating (or maybe "terrible" is more accurate). Another strong blend of action and character. The episode begins right where 18 ended. Shinji is understandably upset by what he was forced to do to the other Eva Unit, and he quits NERV (again), determined to leave his father forever. Of course, another pesky Angel appears and quickly dispatches Asuka and Rei in Evas 00 and 02. Once again, Shinji finds himself pulled, reluctantly, into the fight. This episode again goes into Shinji's mind. He converses with a younger version of himself, discussing why he always runs away. These moments of the series are boring or confusing to many, but I think they are a standout example of the risky, unique, and impressive elements of the series. I can't imagine many other cartoons (even anime) have quite this much character development. Oh, and the ending to this one is a real shocker, the best moment in the series thus far. Episode 20: Form of the Mind, Form of a Man The startling last moments of episode 19 are repeated - Unit One has gone haywire, and Shinji has disappeared from the entry plug. Well, not exactly. He has reverted to a sort of primordial soup within the liquid oxygen of the plug - he has fused with the Eva. As his friends race to restore his body and soul, Shinji again undergoes a psychological self-exam. He discovers some surprising things about himself, and the true nature of the Evangelions. Is he really alone in there? This episode is also a series highlight, once again exhibiting how much can be done with simple animation and suggestion/repetition. It is hard to describe these heady episodes without giving too much away, but suffice it to say, this one can't be missed (and there's ANOTHER great ending). Great. So when does volume seven come out? Image Transfer Review: Oddly enough, the image transfer on this volume is in most ways better than the previous, but with one glaring difference. As with previous volumes, colors look natural and are well presented with no noticeable blooming or bleeding. Aliasing is present, but is kept to a minimum. The 'shaky image' problem of the last few volumes is gone. The print must've been digitally cleaned, because it doesn't suffer from the somewhat dingy look of the earlier discs. Unfortunately, the black level is a bit of a problem. Just watch the beginning of episode 20 - the contrast is way off. The black appears to be almost shiny, for lack of a better term. Adjusting my TV settings helped a bit, but since I'd configured the set with Avia, it shouldn't have been a problem. Overall, however, this is probably the best disc yet image-wise. Audio Transfer Review: The quality of this mix is equivalent to the previous disc in the series as well. Dialogue is always clear and understandable. The mains spread out the score and sound effects a bit, but the soundstage really isn't very wide. There are some nice panning and directional effects during the action scenes, however. Extras Review: Aside from the usual ADV trailer gallery and some brief character bios, this disc is featureless. The four dubbed tracks speaks well of the DVD format, but I wish we could have some more background info. What else needs to be said? The show just keeps getting better. If you are a fan, you've no doubt ordered this already. Only two more to go!